We want to work with you on your garden, farm, or landscape goals and help identify and solve any problems you may be experiencing. Once your soil is in balance and alive with beneficial soil organisms, you will see improvements in quality and yield as well as reductions in pest and disease problems. Some patience will be required. It takes time for the soil amendments to become incorporated and bioavailable. This being said, you will see results in the first year and increasingly so in subsequent years. Bringing your soil into balance may require an initial investment in soil amendments but adjustments to maintain your soil in optimum fertility will be comparatively minor. We recommend a soil test in the fall to determine what needs to be added before the onset of winter, and again in the spring to determine what may be needed for the growing season. Together, we will look at soil structure, nutrients, weed control, and organic matter (compost) management. We will track down answers to problems you are experiencing and report to you on research, and farm or garden demonstrations. First, you must know where you are to get where you are going. This is why a soil test is imperative. The desired soil test is the “Basic” or “Standard” test with extras. It covers total CEC (Cation Exchange Capacity), percent organic matter, pH, base saturation of primary cations (Calcium, Magnesium, Potassium, Sodium), primary anions (Sulfur and Phosphorous), exchangeable Hydrogen, secondary elements (Boron, Iron, Manganese, Copper, Zinc), and Aluminum. The “extras” include Cobalt, Molybdenum, Selenium, and Silicon. These trace minerals are required in very small amounts but play a crucial role in plant, human, and animal health. A. The Initial Investment. Building optimum soil fertility is an investment in your operation. However, this expenditure will pay for itself, and you will verify this on your own fields. B. Where To Begin. Rather than balancing the entire acreage, field, or garden, consider starting with 5% to 10% of the area you wish to improve. Then treat this area with the amendments required for optimum balance. The untreated areas become a control against which you can measure improvements. It is advisable to make the area to be treated large enough to buy soil amendments in economic quantities whenever possible. C. Maintaining what has been accomplished. Boron and Sulfur are readily taken up by plants and are subject to some leaching. We recommend two soil tests annually, one in the fall and one in early spring. These tests will show how much Boron and Sulfur will be needed to maintain optimum fertility. If a minor adjustment is needed on other minerals, it can be done at this time as well. Yearly maintenance will not require nearly the same quantities of amendments it took to correct the deficiencies and excesses to reach optimum balance. D. What To Expect. Expect to see improvement in the first year and increasingly so each year thereafter as the minerals become more and more bioavailable to plant roots. It may take three years for crops to realize their full genetic potential in quality, nutrient density, and yield as well as disease and pest resistance. You can also expect to see a reduction in weed problems, as well as reductions in expenditures for other traditional inputs. First, review and complete page 2 of the Area Description Form and email it to wcsmith@sustainablesoils.com. 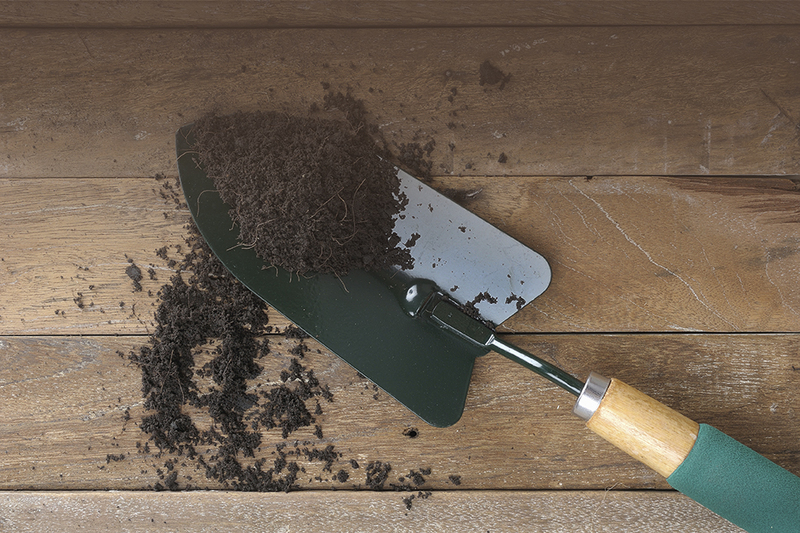 The information requested on the form can tell us a great deal about your soil. To obtain a representative soil sample of the area being treated, you may need to take eight to ten samples while avoiding any unusual areas. You want to sample the top six inches (15 centimeters) of soil. This is the aerobic zone where most of the root growth and nutrient exchange takes place. Clear the surface area of debris and organic matter. With a clean shovel, dig a hole six inches deep then take a thin slice from one side of the hole. This is the soil sample. Repeat in different parts of the area until you have a representative sample of the area being tested. Add all the samples to a clean stainless steel or plastic container and thoroughly mix together. Remove any foreign matter, large chunks of organic matter, rocks, etc. Transfer one cup of this representative mixture into a clean plastic or heavy paper bag. (If the soil is very wet when being sampled, spread it out and let it dry until you can pick it up without mud sticking to your hand). Seal the bag well and box the sample(s) along with a completed page 3 of the Area Description Form. Ship the box directly to Logan Labs Soil Testing Services in Lakeview, Ohio. Logan Labs reports in a method similar to the one we use to write the soil prescription and we have found them to be very reliable, accurate, and prompt in getting the results to us. Logan Labs is also authorized by the USDA as an APHIS Inspected Facility, which means the lab is approved to receive soil shipments. NOTE: Those outside the continental US and Alaska who wish to send a soil sample to Logan Labs will need to download a USDA import permit and attach it both to the bag you are mailing your sample in, as well as to the outside of your package. Click here for a printable PDF of USDA Form PPQ 525. Additional regulations prohibit the importation of soil from certain Canadian provinces. Please email info@sustainablesoils.com for more information. The cost of the laboratory soil test is $43 for each representative sample you submit. You will be billed directly by Logan Labs. When we receive the soil report from Logan Labs, the lab test results will be combined with the information on the Area Description Form and we will begin a detailed study and evaluation of the results, make fertility and mineral amendment recommendations, and begin writing a custom soil prescription tailored to your climate, soil, and crops. We will be happy to email your lab report to you for your review. Every soil test result is given all the personal attention and time required to create a customized, scientifically calculated prescription for optimum mineral balance, health, and fertility for your soil utilizing USDA National Organic Program approved amendments. Click here to see a couple of Sample Soil Prescriptions. You will receive a PayPal invoice for $50 for each custom soil prescription you are requesting. The prescription will not be written until payment is received. Our custom amendment blending facilitates an even application. If you decide to move forward and wish us to custom blend your amendments, we will calculate the cost of your custom mineral blend based on the total area being treated and the amounts required and email a PayPal invoice to you for review. Upon receipt of payment, your soil amendments will be blended and shipped to you. 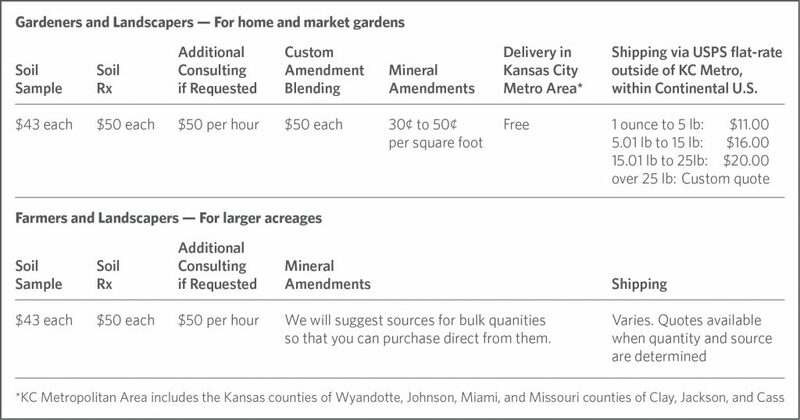 The cost of the soil amendments does not include shipping (see Payment and Shipping for estimated shipping costs). Broadcast the blend evenly over the entire area and work it well into the plow layer through the top six inches (15 centimeters) of soil. Water it in and wait at least two weeks before starting seedlings. Hardy transplants can be planted within a week. Feel free to send us an email and let us know how things are progressing. We will be happy to answer any general questions you may have. If you require additional specific consulting, our rate is $50 per hour. We prefer to provide consulting via email only at wcsmith@sustainablesoils.com. Logan Labs bills directly for lab reports—see STEP ONE above. Sustainable Soils uses PayPal exclusively—see STEP TWO or STEP THREE above. We will calculate the total cost including the most cost-effective shipping, and send you an itemized PayPal invoice. We do not accept personal or business checks. All payments are in US Dollars. Questions? Please email us at info@sustainablesoils.com.